When I became a mom, I have been very watchful to the medicines that were prescribed by the doctors for my children. As much as possible when my children are sick, I would go for herbal treatment and lessen medicine intake to avoid any side effects. But if medicine intake is really needed as advise and prescribe by the doctor, I would religiously follow their prescriptions. It is very important to know the kind of medicine that we are giving to our family especially to our children. For my medicine review this week, let me share my experience with Decolsin suspension. It was last week when I gave this medicine to my five-year-old son. He was diagnosed with bacterial infection causing him high fever accompanied with cough. Aside from the antibiotic medicine, the doctor prescribed Decolsin suspension. 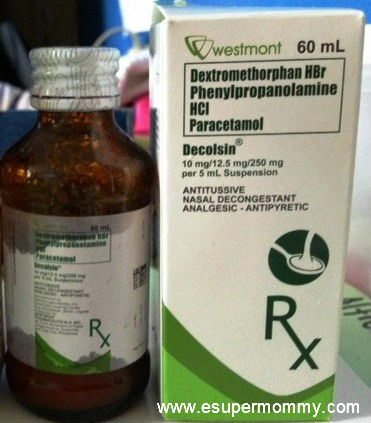 Contents Dextromethorphan HBr, phenylpropanolamine HCl, paracetamol. Indications Relief of cough, clogged nose, postnasal drip, headache, body aches, and fever associated with the common cold, allergic rhinitis, sinusitis, flu, and other minor respiratory tract infections. It also help decongest sinus openings and passages. Contraindications Hypersensitivity to any of the components of Decolsin. Patients with severe coronary disease or cardiovascular disease including myocardial infarction, severe hypertension and ventricular arrhythmia. Repeated administration is contraindicated in patients with anemia, cardiac, pulmonary, renal, or hepatic disease. Warnings Use with caution in patients with high blood pressure, toxic goiter, benign prostatic hypertrophy, heart rate irregularity, glaucoma, and in those taking antidepressants. Patients with heart disease and uncontrolled/untreated high blood pressure should consult a physician prior to taking phenylpropanolamine. Special Precautions Do not give to patients with persistent or chronic cough (eg, with smoking, emphysema, asthma) or when coughing is accompanied by excessive secretions unless directed by a physician. A persistent cough may be a sign of a serious condition. If cough persists for >1 week, tends to recur, or is accompanied by fever, rash, or persistent headache, consult a physician. Paracetamol may cause allergic-type reactions, including anaphylaxis and life-threatening or less severe asthmatic episodes in certain susceptible individuals. Decolsin should be discontinued if hypersensitivity reactions occur. Alcohol Warning: Patients who consume ?3 alcoholic drinks everyday should consult a physician before taking paracetamol or any other pain reliever/pain reducers. Paracetamol can cause liver damage. Decolsin should be given with care to patients with kidney or liver disease including patients taking other drugs that affect the liver. Do not use with any other product containing paracetamol. Do not exceed recommended dose. In case of accidental overdose, contact a physician or poison control center immediately. Prompt medical attention is critical for adults as well as for children even if you do not notice any signs or symptoms. Discontinue use and consult a physician if symptoms do not improve or new symptoms appear. Use in pregnancy: There are no adequate and well-controlled studies using dextromethorphan and phenylpropanolamine in pregnancy. Paracetamol crosses the placenta but the drug has been used widely as an analgesic in pregnancy and no adverse fetal effects have been recorded. However, as with any drug, consult a physician before using this product in pregnant women. Use in lactation: It is not known if dextromethorphan and phenylpropanolamine are excreted in human milk. Paracetamol appears in breast milk but has not been detected in the urine of breastfed infants. Therefore, do not administer to breastfeeding women unless, in the opinion of a physician, the potential benefits of the drug justify the possible risk to the baby. ATC Classification N02BE51 – paracetamol, combinations excl. psycholeptics ; Belongs to the class of anilide preparations. Used to relieve pain and fever. Presentation/Packing Cap (hard gelatin capsule with dark green opaque cap and ivory opaque body) 100’s. Oral susp (red-colored, strawberry-mint flavor, homogenous) 60 mL, 120 mL. From the info above, I did not included the dosage and administration. It is a must to consult your doctor for the dosage and administration before taking medicine. During the first day of taking Decolsin, I noticed that it did help with the fever of my son. It is because of the Paracetamol content of this medicine. Because he is coughing and can’t sleep at night, when he took this medicine he was able to sleep comfortably. The following days, he can already sleep during daytime. He didn’t complain about having headaches but he just said that he is sleepy. Normally after intake of Decolsin, he would sleep after 2 or 4 hours that is why I did not let him take this medicine when he is already attending the class. I just give this medicine at night after dinner. I followed the dosage and administration that was prescribed by the doctor. About the taste, my son likes the sweet strawberry-mint flavor making it very easy for children to take. Just a tip if your child get sick, giving your child 1 tablespoon of honey and a glass of warm water before bedtime helps the child feel relax and sleep tightly. Honey also helps boost the immune system. For medicine intake, always ask your doctor.